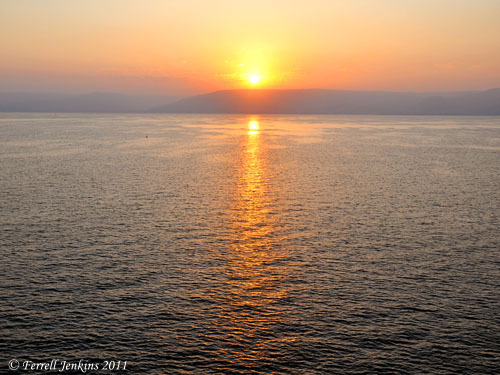 Sunrises on the Sea of Galilee can be extremely beautiful. I know that I have posted several photos of the sunrise, but I wanted to share another one from this morning. Much of the ministry of Jesus was conducted on and around the Sea of Galilee. One of the important events recorded in Scripture is the calling of disciples. We went to Nazareth this morning to worship with the church there. Afterwards we spent a good bit of time in Mash’had, a small Arab town between Nazareth and the traditional site of Cana, trying to locate the tell where the ancient city of Gath Hepher, the home of the prophet Jonah, is thought to be located. Hopefully we will be able to tell you more about that experience later. In May I wrote about locating and walking on a portion of the Roman Road near Golani Junction here. I wanted to share this experience with Leon, so we returned there. There were some other things, but this will be enough for today. It is hot at this time of the year, and especially when tramping around over hill and vale. This entry was posted in Bible Places, Bible Study, Biblical Studies, blog, Israel, New Testament, Old Testament, Photography, Travel. Bookmark the permalink.